My first teacher made very little fuss over the moon being in void-of-course, and said it was similar to Mercury going retrograde, where one should avoid starting a new project. At the time she emphasized that one needed to take time out, to contemplate and to rethink what was going on. One was required to become aware when the event would take place, and to pay heed to the effects it may have in one’s life. Little else was mentioned. I never gave it much thought, as my concerns turn to other areas of astrology that caught my attention and interest. Throughout my years of study I read about the fears one should have, but for some reason it never titillated my interest. Until recently, when I experienced my own thoughts on the matter, as the void of course was on going. It so happen as I was reading a discussion on a horary question on one of my egroups, my thoughts wander about what would happen if the moon was void of course in one’s natal chart? Would the promise that might be indicated by the delineation be the same as in a horary? That nothing will come of it? As I searched the internet for information I came to the conclusion very little was actually written on the subject, and although there were many sources, most said the same thing. Nothing really extensive, but many sources were very concise to the possibilities and the headaches that could be in store for one. What little I came across for the delineation of the natal chart were quotes taken out of the works of Dorotheus, Firmicus, Al-Biruni, William Lilly and others. I have always found the translations of these great writers, very black and white, with very little grey areas for our modern world. Usually I find that I need to reread the text over and over, in order to feel I might begin to understand what is being said. Sometimes I find myself reading a modern text, and suddenly realized an old text I read months back, finally made sense. Realizing I have to spend more time and research on the effects of the void-of-course on the natal, before I can really work it in my delineations. I decided to renew and to review my knowledge and information of the effects it may have in our daily lives. The Moon in my own chart is in Gemini, because of this, there are times I see the planet in an intellectual way, and at other times I feel it very emotionally. This is one reason, every month I write about the ways, the new and full moon affects each one of us. To me, the moon’s energy is the subtle background music in our lives that affect our feelings and our actions without us really being aware of it. As I feel the energies of the different moon phases with its subtle influences on our lives, I am beginning to see how the void-of-course energies in its own ways may be just as important. The moon makes a complete cycle through the twelve signs every 38.5 days and spends approximately 2.5 days in each sign. Void-of-course is the period of time between the last aspect of the Moon while it is transiting in a sign and the moment it begins to enter the next sign. There is a moon void-of-course every couple of days, but the length of the period of time varies widely according to the aspects. The length of time can last a few minutes or hours, or a day, or even more. I actually do compare this cycle, to the Mercury Retrograde period, only that it is more frequent, more subtle, and more enjoyable to experience and to learn from. I think of the moon as reflecting the lights and energies of other planets especially of, the Sun. That isn’t to say that the Moon is not as important of a light or is not equal to the Sun. Where the Sun is concern with itself, the Moon is concern in nourishing and being the support to others. So when the Moon is not in aspect, it appears alone and is not doing what it can do best. It works with the other planets and brings the best out of them. Having no one to care for before it enters a new sign, its main purpose is with its own welfare at the moment, and this is new and confusing for the Moon. Insecurity and carelessness mark this period of time and the Moon seems to have lost its grounding in making major, important and tangible decisions. Setting aside the decisions, this is an excellent time for insights, relaxation, fun and exploring the world around oneself. For me, I took to rereading a very difficult spiritual book which suddenly became clearer, not that I understand it, but I was able to appreciate the content more. In conclusion, it seems to me, a step in the right direction in dealing with the Moon void-of-course is to avoid starting any project. This is not to say we cannot revisit and review other projects that are already in the works. What it does mean is that we must take care of the information we have and to be aware that we may not have the full picture at hand. Any decision needs to be done with care and caution, especially at this time. Expecting that things may turn out differently than what we hoped for and dealing with it, is crucial if we are to succeed. However, with the right attitude, this period can be quite creative, exciting relaxing, restful, meditative and resourceful. This is mot the time to make a decision, but if one must, make it with thoughtfulness and vigilance. With as much wisdom one can muster up, is a help. Thinking consciously instead of carelessly is essential. We can get through the Moon Void-of-Course with flying colors by being intentionally aware of how its energies work and to work with it. As an advocate that astrology should be considered a serious study with implications of it’s’ ability to forecast correctly, and that if any branch of the art that can provide evidence of the accuracy of it’s’ predictions, is exciting. Being a member of several horary study groups, I can attest to some amazing predictions that have proven to be very correct, and incredibly enlightening in it’s’ perception of the circumstances and situations of the matter. Horary astrology is an ancient branch of the art in which an astrologer attempts to answer a question by constructing a horoscope for the exact time at which the question was received and understood by the astrologer. The system is an outstanding and a very exacting tool to get insights into situations and possibilities of a variety of subjects, objects and thoughts, because it deals with specific questions and replies with specific answers. Exact birth data of the querent is not required to provide insights into dealing with problems and difficult situations. In a horary chart, we the participants have a choice in the matter to choose whatever actions we wish to take, according to the potential successes or problems that are revealed by the chart. The keyword is “forewarned is forearmed” because the information between success and failure in any endeavor is how we use it to achieve what we desire. 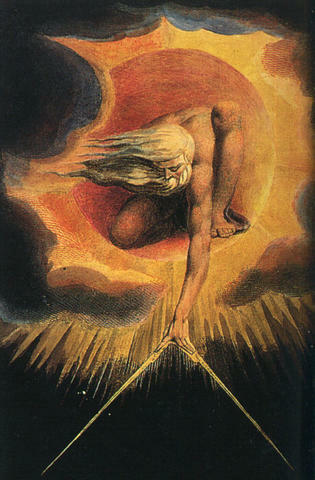 Major contributors to western horary astrology were William Lily, known in the English speaking world as the authority and father of Horary, along with John Dee, John Gadbury, Morin and a host of other writers whose works from around the ancient world were translated into English. Many modern writers and scholars need to be included in this list in bringing this subject matter to the masses. My endeavors to get this practice under my belt have caused me to search and read as much as I have time for, and as of late with my second study and reading of the following book, which I feel has help me a lot to understand how it works and functions. To give you a little background of how I discovered this author, will allow you to understand how this person has affected my thinking, and have given me fuel to continue my studies with the translations of ancient writers of the art. I find reading the earlier translations very difficult, but with some of the written material of today’s writers on the subject, I am able to bulldoze my way through some of the difficult text until I begin to absorb it. I have a love for solar returns because I feel it can be very helpful in giving indications of the important areas in any new year that will be important to work on. I ran across the author’s book on solar returns which included his interpretation of the aphorism of my favorite author, Morin. His book was so well written to my way of thinking, and in discovering that he wrote a book on horary; I couldn’t wait to read it. In reading this book, it definitely met my expectations and more. 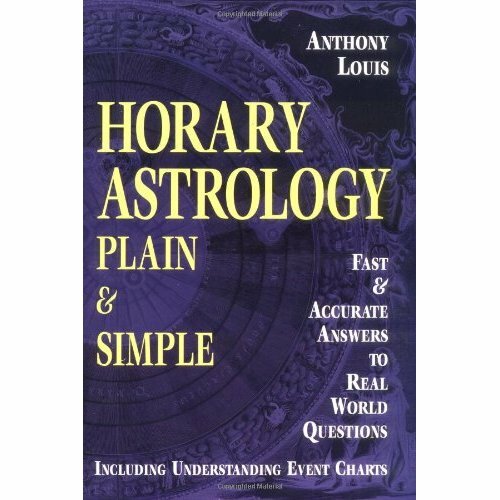 The book is “Horary Astrology Plain & Simple by Anthony Louis”, and if you are interested in the subject matter, I wouldn’t walk to the book store, but run to it. I would like to caution you, that after reading this book, one may think you are capable of giving readings, but I have learnt the hard way that only more studies on the subject, and the old saying “ practice makes perfect” is really true. The important attributes of this book is how he organized and arranged, how he presents the materials, charts, tables, and information to the reader. Although he is a modern thinking astrologer, he has included traditional astrological materials for the reader’s edification, to give a broader interpretation to the material presented. I am not saying other books on the subject shouldn’t also be read, but I think one should start with this one first, where everything is laid out like Horary 101, and then the other authors will be clearer and better absorbed. 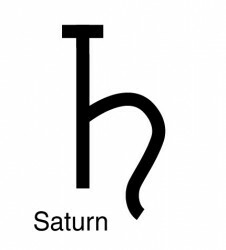 If we are to become the astrologers we hope to become, the foundation of Horary is very important in the delineation of any type of chart. What horary techniques can give in our natal chart delineations would be a broader and more perceptive and caring interpretation of what is at hand. Horary tells us to keep things simple, and in its simplicity, delineation can be extremely enlightening and awakening then one can realize. To see life and its problems like little children, will give us a different viewpoint in which to solve our problems. Horary astrology definitely is a blast from the past that will not only last, but will bring new vision and insight to everything we hold dear to our hearts. Horary astrology is an ancient branch of the art, in which an astrologer attempts to answer a question by constructing a horoscope for the exact time at which the question was received and understood by the astrologer. The answers to the horary question might be a simple yes or no, but it is generally more complex with insights into the motives of the querent (questioner), the motives of others involved in the issue, and the options available. William Lilly is regarded as one of the principle authorities in horary astrology in his time and ours. 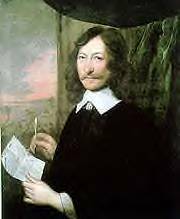 England’s most illustrious astrologer led a very colorful life in a politically unstable period of time (1602 to 1681). The background of the story is about a gentleman, who was not able to finish his higher education due to the financial difficulties of his father and had to become a manservant. He had many happy years with his employer and married the wife after his death. And to make a long story short, his wife died also and left him with some money, which he could use to purchase the house he lived in with a couple of rentals, which would give him the means to live without working. Unfortunately like the chart showed, the seller had the upper hand and was demanding a lot more money then the property was worth. Although he would be able to borrow the money in time as the chart forecasted, the transaction did not leave him much money to live on. I am sure that Deborah Harding would agree with me that most astrologers would predict caution and awareness, and the possibility of forgetting about the deal. 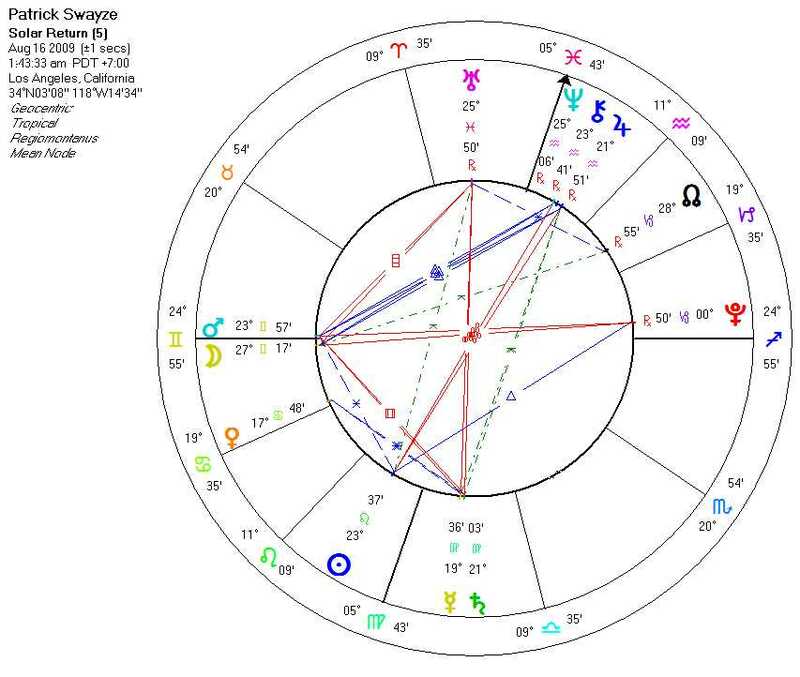 This chart proves to me the need to look at a natal chart when confronted with a difficult horary which could go either way. The important thing about Mr. Lilly, does he have the talent and wisdom to bring a difficult situation to a happy ending? We find the answer in his natal chart with many planets in the second house of money. Although William Lilly chose to buy the houses, I believe that destiny played a part in redirecting him to a new career that would bring him fame and fortune. At the time of the sale, he had only been studying astrology for two years, and about two years after the sale he realized he could make a living from it. Later in 1647 he published “Christian Astrology” which brought him fame and fortune. My thoughts are the following: 1.) Mr. Lilly may have had joyful memories of the place, but as a land owner, he would be well respected. Therefore he would have achieved a status worthy of a gentleman of the period. 2.) Realizing he had no income he made an effort to learn what he enjoyed doing. Difficulties are the mother of innovations in ones’ life. We learn from hardship and pain and grow from that point in our lives.. Had he decided not to buy the property, history may have been written differently, as he may have been able to live on the inheritance and astrology may not have become that important in his life. So in truth William Lilly not only chose his destiny, but allow destiny to choose and guide him. I am wondering what you think about this matter, and if everything went smoothly in our lives, would we be were we are today? 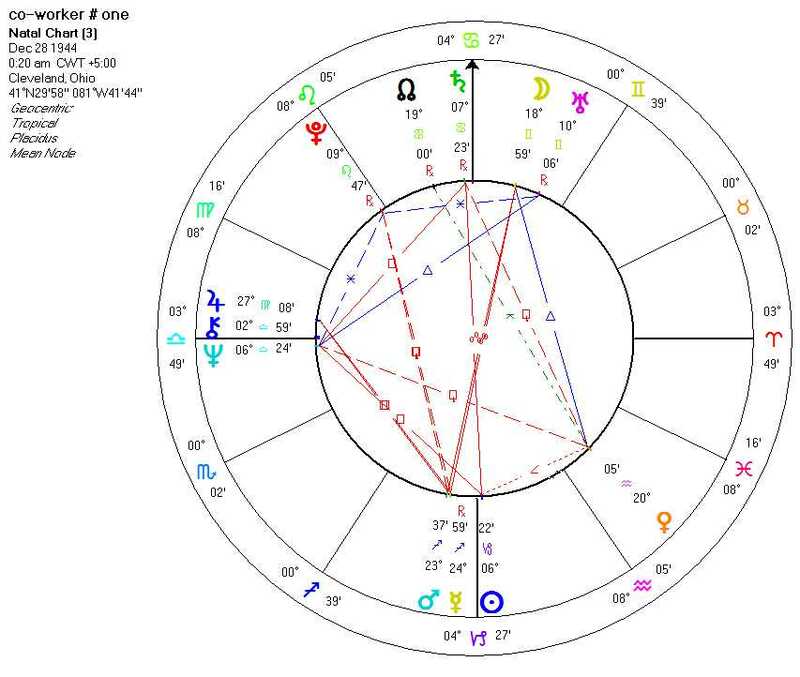 To me this chart illustrates the need for astrologers to relate solar, lunar return and horary charts to the natal horoscope, and to realize that although we have free will, we are still fulfilling our destiny.